Fringilla hyemalis Linnaeus, 1758, South Carolina. Sixteen subspecies. English: Gray-headed junco, pink-sided junco, red-backed junco, Schufeldt's junco, slate-colored junco, Thurber's junco, Townsend's junco; French: Junco ardoisé German: Junko; Spanish: Junco Ojioscuro. 5-6.5 in (13-17 cm); 0.5-0.88 oz (15-25 g). Medium-sized sparrows that lack breast streaking and have white outer tail feathers. They are geographically variable, and the 16 subspecies can be divided into five subspecies groups. 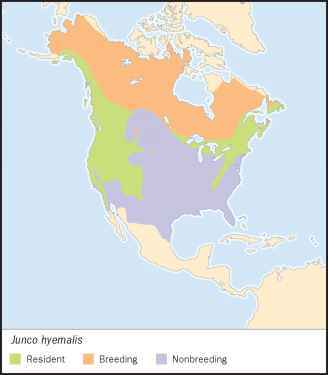 Slate-colored juncos (J. h. hyemalis) are found in eastern North America west to Alaska and the mountains of British Columbia. Adults have pink bills and are uniformly gray above, with a white belly; females are similar to males, but are paler gray, often washed with brownish. White-winged juncos (J. h. aikeni,) breed in southeast Montana, western South Dakota, and northwest Nebraska. They are grayish above, with a white belly and two white wing bars. Pink-sided juncos (J. h. mearnsi) breed in southeast Alberta, southwest Saskatachewan, and south to southeast Idaho. They have a dull brown back and pink flanks. Gray-headed juncos ( J. h. caniceps) breed in the Rocky Mountains. They have a gray head with dark gray around the eye and a rusty-red mantle. The J. h. oreganus group have a dark gray head, cinnamon brown upperparts, and pinkish washed flanks. Juvenile juncos are dusky, and heavily streaked both on the back and breast, with whitish bellies. Breeds north to the limit of trees in Alaska and Canada and south to northern Georgia, northern Ohio, northern Minnesota, central Saskatchewan, and in the mountains to central New Mexico and Arizona, and northern Baja California, Mexico. Winters along the Pacific Coast of southern Alaska, southern Yukon, and northeast British Columbia, east through central British Columbia, southern Manitoba, southern Quebec, and southern Newfoundland, south to south Florida, the Gulf Coast, and northern Mexico. Breed in a variety of habitats, but especially in open coniferous or mixed woodlands. In winter, they are found in brush, woodland edge, and hedgerows. Territorial and found in pairs or family groups during the breeding season. Males sing from an exposed perch in a tree, often from near the top of a small conifer. In winter, they often occur in loose flocks and frequently associate with other species of sparrows. They hop or run on the ground. Juncos feed on the ground. In summer their diet is mostly insects; seeds are the principal winter food. Monogamous. 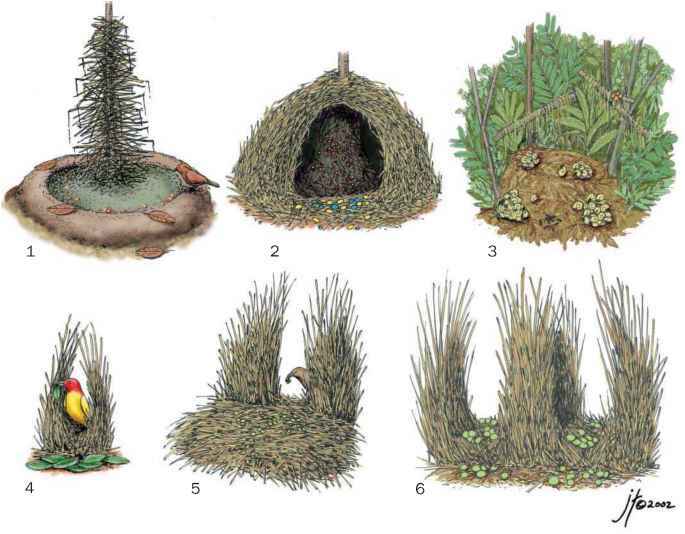 The nest, which is a cup of woven grasses and rootlets, usually is placed on the ground but occasionally is found low in a bush. Nesting takes place from May through July. They lay three to six eggs. Incubation lasts 11-13 days, and the young fledge after 9-13 days. Both parents feed the young.